On this date in 1941 Adolf Hitler cancelled the Aktion T‑4 eutha­na­sia pro­gram that he had person­ally put in place in Septem­ber 1939. Nor­mally Hitler had a policy of not issuing written instruc­tions for poli­cies relating to what would later be called “crimes against human­ity,” but he made an excep­tion when he pro­vided written author­ity for the eutha­na­sia pro­gram in a confi­den­tial Octo­ber 1939 letter. In the months since its intro­duction, the eutha­na­sia pro­gram, known as T‑4 after its Berlin address at Tier­garten­strasse 4, had pro­voked strong opposi­tion from both the German public and influen­tial church leaders, partic­ularly the Bishop of Muenster, August von Galen. Von Galen’s ser­mons broke the secrecy that had hither­to sur­rounded the pro­gram, which he pro­tested was unlaw­ful by Ger­man and divine law (Fifth Com­mand­ment). 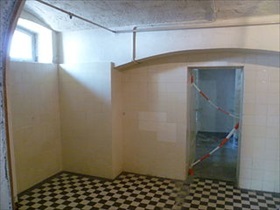 Despite its can­cel­la­tion, Aktion T‑4 operated unofficially until the end of the Nazi regime in 1945. The prin­ci­pal archi­tect and co-director of the T-4 pro­gram was none other than Hitler’s per­sonal phy­si­cian, Dr. Karl Brandt. T‑4 phy­si­cians system­at­ically killed those deemed “unworthy of life” (“lebens­un­faehig”), including those con­sidered “genet­ically in­ferior,” “racially defi­cient” (Jews, Slavs, and Gypsies), “mal­ad­justed” (usually teen­agers), and men­tally or physi­cally im­paired. Even German civil­ians who suffered men­tal break­downs after air raids were “selected for treatment.” As a result of the T‑4 pro­gram, by the end of 1941 between 75,000 and 100,000 chil­dren and adults had been killed by lethal in­jec­tion, star­va­tion, or in gas­sing instal­la­tions designed to look like shower stalls (a foretaste of Auschwitz-Birkenau and other death camps). Parents or relatives of those killed were typically informed that the cause of death was pneumonia or a similar ailment, and that the body had been cremated. Other bodies were secretly buried. Opera­tion Bar­ba­rossa, the June 1941 inva­sion of the Soviet Union two months earlier, opened up rich new opportu­nities for newly dis­placed T‑4 person­nel, and they soon set them­selves up in the con­quered eastern terri­tories working on a vastly greater killing pro­gram: the “final solu­tion of the Jewish question.” In the con­cen­tra­tion and death camps in Poland, Brandt over­saw and par­ti­ci­pated in sadis­tic “medi­cal experi­ments” on inmates. At the post­war Nurem­berg trials, Brandt was the lead medi­cal defen­dant. Unrepen­tant to the end, he was convicted and sentenced to hang, an act carried out on June 2, 1948. 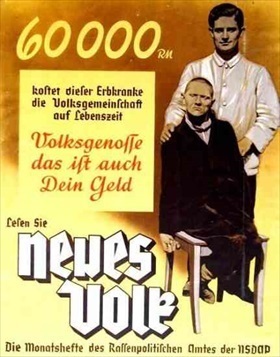 Left: This circa 1938 poster reads: “60,000 Reichs­marks is what this per­son suf­fering from a heredi­tary defect costs our com­munity during his life­time. Fellow citizen, that is your money too. Read Neues Volk (New People or New Nation), the monthly magazine of the Office of Racial Policy of the NSDAP [National Socialist German Workers’ Party, or Nazi Party].” Many of the poli­tical ini­tia­tives of the Nazis arose from within the scien­tific com­munity, and Ger­man medi­cal jour­nals openly dis­cussed the need to find solutions to Germany’s Jewish and gypsy “problems,” among others. Right: “Lion of Muenster,” Bishop Clemens August Graf von Galen. 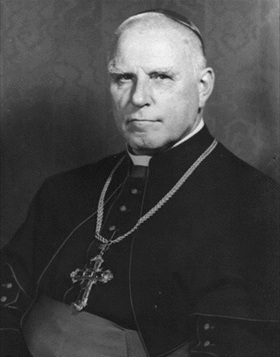 Polit­ically con­ser­vative and a sup­porter of Nazi nation­alism early on, Bishop von Galen came to decry Hitler’s per­se­cu­tion of the Catholic Church. He attempted to stop the Nazis’ eutha­na­sia pro­gram, denouncing it from the pulpit in 1941. He also con­demned Nazi depor­ta­tions of Jews to the East. A ser­mon he gave in 1941 served as the inspi­ra­tion for the anti-Nazi group “The White Rose,” and the ser­mon it­self was the group’s first pam­phlet. Von Galen suf­fered virtual house arrest from 1941 on­wards. Although he did not parti­ci­pate in the July 1944 assas­si­na­tion attempt on Hitler’s life, the Nazis linked him to it, and he was sub­se­quently impri­soned in Sachsen­hausen concen­tration camp until its liber­ation. He died in 1946, the same year he was appointed cardinal by Pope Pius XII. 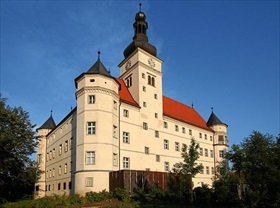 Left: The Hartheim Euthanasia Center near Linz in Aus­tria was one of six eutha­na­sia insti­tutes in the Third Reich. Over a period of 16 months between May 1940 and Septem­ber 1, 1941, 18,269 peo­ple were killed at Hart­heim. In all it is esti­mated that a total of 30,000 peo­ple were mur­dered there. Among them were the sick and the handi­capped, as well pri­soners from concen­tration camps too ill to work, such as those from nearby Maut­hausen-Gusen. The killings were carried out using carbon monoxide poisoning.